Scoliosis is a three-dimensional deformative abnormality of the spine. Scoliosis is defined by the Cobb's angle of spine curvature in the coronal plane, and is often accompanied by vertebral rotation in the transverse plane and hypokyphosis in the sagittal plane. These abnormalities in the spine, costal-vertebral joints, and the rib cage produce a ‘convex’ and ‘concave’ hemithorax. The rotation component starts when the scoliosis becomes more pronounced. This is called a torsion-scoliosis, causing a gibbus. Scoliosis can be present from birth. It is then called congenital scoliosis. Congenital scoliosis represents a spinal malformation due to defects of formation, segmentation or mixed ones. It is characterised by a longitudinal and rotational imbalance. Other sorts of scoliosis can be developed during growth, any causes for this are still not found. We then speak of Weiss Scoliosis. Approximately 85% of cases are idiopathic. Based on the age of presentation, scoliosis is further categorized as infantile, juvenile or adolescent idiopathic. Adolescent idiopathic scoliosis (AIS) has the highest prevalence of the three categories. This type of scoliosis is present at age ten and lasts till the end of growth. Its prevalence is dependent on the curvature of the spine and gender of the patient. Epidemiological studies have demonstrated that IS is significantly more frequent in girls than boys, reaching a ratio of 4:1. Anwer et al. described a prevalence of 2,5% with a Cobb angle larger then 10 degrees. They also stated that a variety of risk factors may result in a higher curve progression. These factors include the following: female gender, age of 10–12 years, absence of menarche, presence of thoracic curves, curve size at presentation >25 degrees, Risser sign of 0-1, and residual growth potential. The vertebral columm normally consists of 24 separate bony vertebraes, together with 5 fused vertebrae that form the sacrum, and usually 4 fused vertebrae that form the coccyx. These 24 separate vertebrae can be divided in three categories: 7 cervical vertebrae, 12 thoracic vertebrae and 5 lumbar vertebrae. 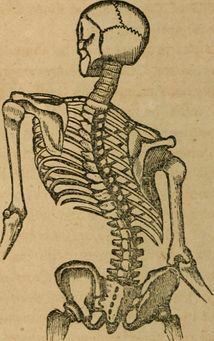 Variations can occur such as Hemivertebrae and fused vertebrae. The anterior pillar of the spine has weight-bearing and shock-absorbing functions. 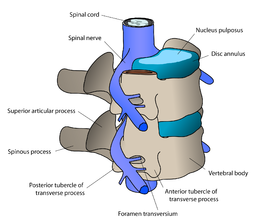 There is an intervertebral disc between adjacent vertebral bodies; with the exception of the first and second cervical vertebrae. Each disc consists of a nucleus pulposus surrounded by an annulus fibrosus. The posterior pillar comprises the apophyseal joints that are formed by the articular facets on the articular processes. There are two normally occurring curves in the cervical spine: the upper cervical curve extending from the occiput to the axis, and the longer lordotic curve of the lower cervical spine extending from the axis to the second thoracic vertebrae. The upper cervical curve is convex forwards and is the reverse of the lower cervical curve. This curve is concave forwards, extending from T2 to T12. The concavity is due to greater depth of the posterior parts of the vertebral bodies in this region. In the upper part there is often a slight lateral curve with the convexity directed to either the right or left. The lumbar curve is convex forwards and extends from L1 to the lumbosacral junction. The curve extends from the lumbosacral junction to the coccyx. Its anterior concavity faces downwards and forwards. Scoliosis is the most common spinal disorder in children and adolescents. A scoliosis is characterized by a side-to-side curvature of the spine >10°, usually combined with a rotation of the vertebrae and most often a reduced kyphosis in thoracic curves. Scoliosis may be structural or non-structural. Non-structural scoliosis can be corrected, they occur due to posture or compensation of the spine. Structural scoliosis are deviations that cannot or just partially be corrected. You can distinguish the structural from the non-structural scoliosis with the Adam Forward Bent Test (mentioned below). Scoliosis patients are classified in different types according to age of onset, etiology, severity and type of curve. Each type shows different characteristics as rate of curve progression, degree and pattern of the three-dimensional deformity. The two major groups of scoliosis are idiopathic scoliosis and non-idiopathic scoliosis. Caused by malformation of vertebrae like hemivertebra, unilateral bar or block vertebra. It may not be clinically evident at birth but develops until adolescence. Genes that are associated with vertebral malformation have been identified in several studies, and similar defects have been induced in animal models by hypoxia or toxic agents. Neuromuscular scoliosis is caused by insufficiency of active stabilizers (including the muscles and tendons surrounding the spinal column like the musculus longus capitis or the musculus longus colli) of the spine like cerebral palsy, spinal muscular atrophy, spina bifida, muscular dystrophies or spinal cord injuries. Surgical treatment of neuromuscular scoliosis is associated with the highest rate of complications compared to other types of scoliosis. Mesenchymal scoliosis is caused by insufficiency of passive stabilizers (consisting of vertebrae, facet joints, intervertebral discs, spinal ligaments like ligamentum flavum and ligamentum longitudinale anterius, joint capsules and passive muscle support) of the spine like Marfan’s syndrome, mucopolysaccharidosis, osteogenesis imperfecta, inflammatory diseases or postoperative after thoracic surgery (open heart surgery). Infantile scoliosis develops at the age of 0–3 years and shows a prevalence of 1 %. Mau and McMaster reported about a radical decrease in number of infantile scoliosis in the 1980s, probably related to the recommendation of prone position for the infants. McMaster and Diedrich described that, in contrast to adolescent idiopathic scoliosis (AIS), there is a regression of scoliosis in more than half of the cases. Mehta described the rib–vertebra angle difference and identified that an angle difference of more than 20 indicates a poor prognosis and rapid progression. Juvenile scoliosis develops at the age of 4–10 years and comprises 10–15 % of all idiopathic scoliosis in children, untreated curves may cause serious cardiopulmonary complications, and curves of 30 and more tend to progress, 95 % of these patients need a surgical procedure. Adolescent scoliosis develops at the age of 11–18 years and accounts for approximately 90 % of cases of idiopathic scoliosis in children. Adult scoliosis (de novo scoliosis in adults): this type of scoliosis has a prevalence of more than 8 % in adults over the age of 25 and rises up 68 % in the age of over 60 years, caused by degenerative changes in the aging spine. Anwer et al described a prevalence of 2,5 % in the general population with a Cobb angle larger than 10 degrees. Decreasing pulmonary function is a major concern in progressive severe scoliosis. Factors associated with chronic lumbar pain include: single curve (OR, 3.85; 95% CI, 1.85-8.01), brace wearing (OR, 3.19; 95% CI, 1.56-6.52), moderate depression (OR, 2.49; 95% CI, 1.08-5.71), moderate/severe daytime sleepiness (OR, 2.17; 95% CI, 1.10-4.28). The progression of scoliosis leads to thoracic cage deformity and concomitant pulmonary compromise. Based on the results of the present study, impairment of function was seen in more severe cases of spinal deformity, proximally-located curvature and older patients. Thorax deformity in the anterior-posterior and medial—lateral planes is primarily assessed for clinical purposes using planar radiographs. CT imaging, the gold standard for transverse plane thorax deformity characterization, is also used to complement AP and lateral radiographs. Scoliosis-induced lateral spine curvature in the coronal plane and vertebral rotation are commonly used for clinical assessment and their inter-relationship has been widely documented. Furthermore, additional evidence supports the subsequent contribution of spine distortion towards progression of thoracic cage deformity. Surface electromyography (EMG) examination, magnetic resonance imaging or static and dynamic postural evaluation can be used for a very precise diagnosis. The static postural evaluation serves to measure body sway and changes of the projection of the centre of gravity in a free standing position. It is used to diagnose disturbances of transfer of the force of gravity in patients with IS. The static posture evaluation uses a platform to record ground reaction forces in a static standing position. The dynamic posture evaluation uses a platform to record ground reaction forces as well as body sway during walking and the centre of gravity during jumps and different activities. The Superficial EMG, is helpful in examining spinal muscle work. Scoliosis is a condition that can arise from various etiologies. Evaluation of scoliosis treatment should include the patient’s perspective, which can be obtained with the use of patient-reported outcome measures. Generic instruments to assess health-related quality of life (HRQL) can been used, such as the SF-36 questionnaire and the EuroQol5D instrument. On the other hand it is recommended to use disease-specific instruments for this purpose, such as the SRS-22 Patient Questionnaire and the quality of life profile for spinal deformities (QLPSD). The perception of the trunk deformity and body image according to the patient can be assessed by several instruments, such as the Walter-Reed Visual Assessment Scale (WRVAS), the Spinal Appearance Questionnaire (SAQ), and the Trunk Appearance Perception Scale (TAPS). The impacts of the brace use can be measured with specific scales: Bad Sobernheim Stress Questionnaire (BSSQ) & Brace Questionnaire (BrQ). It is important to know that the available instruments to evaluate the treatment for non-idiopathic scoliosis have not been sufficiently validated and analysed. The aim of the functional examination is to distinguish between faulty posture and actual idiopathic scoliosis. 1. Examination of the active movements(flexion, extension and side flexion) of the spine in the cervical, thoracic and lumbar segment. 2. The Adam forward bend test can be used to make a distinction between structural scoliosis or non-structural scoliosis of the cervical to lumbar spine. The test can be performed in the standing and sitting position. In standing position, the examined person is asked to bend forward looking down, keeping the feet together, the knees straightened, shoulders loose and hands positioned in front of knees or shins with elbows straight and palms opposed. If the scoliosis is present in both standing as bending position, the scoliosis is structural. If the scoliosis is present in standing position but disappears when the examined person bends forward, the scoliosis is not structural. In the sitting position, the examined person is seated on a chair with a height of 40 cm. The examined person is asked to bend forward and place his head between the knees, with his shoulders loose, elbows straight and hands positioned between the knees. The position of spinal processes and presence of a costal hump are evaluated. Locate the most tilted vertebra at the top of the curve and draw a parallel line to the superior vertebral end plate. The angle formed between the two parallel lines is the Cobb angle. If the measurement is equal to 0°, there is a symmetry at the particular level of the trunk. An asymmetry at the particular level of the trunk is found, if the scoliometer measurement is equal to any other value. 5. Pulmonary function testing is useful in the preoperative evaluation of patients. FEV1 provides an assessment of flow function. Patients with early-onset scoliosis, defined as a lateral curvature of the spine under the age of 10 years, are offered surgical treatment when the major curvature remains progressive despite conservative treatment (Cobb angle 50 degrees or more). Spinal fusion is not recommended in this age group, as it prevents spinal growth and pulmonary development. With regard to conservative treatment of patients with congenital scoliosis, it should be noted that there are limited data available in the literature. A review concluded that patients with specific types of segmentation failures, like unilateral unsegmented bars, will not benefit from conservative treatment, while the same applies to formation failures with curves of > 20 degrees in infancy. Nevertheless, there are reports that a conservative approach might be beneficial in mild cases with formation failures in the first three years of life. Furthermore, the review concluded that in patients with formation failures further investigation is needed to document where a conservative approach (bracing treatment) would be necessary. In general, most congenital scoliotic curves are not flexible and therefore are resistant to repair with bracing. For this reason, the use of braces mainly aims to prevent the progression of secondary curves that develop above and below the congenital curve, causing imbalance. In these cases, they may be applied until skeletal maturity. Spinal surgery in patients with congenital scoliosis is regarded as a safe procedure and many authors claim that surgery should be performed as early as possible to prevent the development of severe local deformities and secondary structural deformities that would require more extensive fusion later. Mostly it is done during adolescence, but newer techniques allow good correction to be accomplished into early adulthood. The goals for surgical treatment are to prevent progression and to improve spinal alignment and balance. The hips and shoulders should be level, and the head over the sacrum while maintaining sagittal alignment. The spine is corrected with a combination of rods, hooks, screws and wires while being fused by bone graft – either from the patient, a cadaver or artificially. On the other hand, early and late complications are also described in literature, concerning not only intraoperative and immediate postoperative problems, but also the safety and efficacy of the spinal instrumentation and the possibility of developing neurological disorders and the long-term effect these may have on both lung function and the quality of life. A review (2011) concluded that patients with segmentation failures should be treated surgically early, according to the rate of deformity formation and certainly before the pubertal growth spurt to try to avoid cor-pulmonale, even though there is lack of evidence for that in the long-term. A magnetically controlled growing rod (MCGR) is a nobel technology that enables non-invasive spinal lengthening in an awake patient in an out-patient setting. The indications for MCGR are identical to those of traditional growing rods, but MCGR has advantages of obviating the need for repeated surgical distractions. Physical therapy and bracing are used to treat milder forms of scoliosis to maintain cosmesis and avoid surgery. Scoliosis is not just a lateral curvature of the spine, it’s a three dimensional condition. To manage scoliosis, we need to work in three planes: the sagittal, frontal and transverse. Different methods have already been studied. The conservative therapy consists of: physical exercises, bracing, manipulation, electrical stimulation and insoles. There is still discussion about the fact that conservative therapy is effective or not. Some therapists follow the ‘wait and see’ method. This means that at one moment; the Cobb degree threshold will be achieved. Then, the only possibility is a spinal surgery. The physical therapist has three important tasks: to inform, advice and instruct. For the treatment of scoliosis, it’s not only important to do the correct exercises but the physical therapist also needs to inform the patient &/or parents about his/her situation. An educational program makes sure that the therapy accuracy from the patient improves. Some physical therapists recommend a brace to prevent the worsening of the scoliosis. An often used brace is the Milwaukee brace. Nevertheless the evidence for bracing is controversial. Maruyama T., Nakao Y. and Takeshita T. studied the effect of bracing in a review (2011). They compared brace treatment with no-treatment, other conservative treatments or surgery. The analyzed outcome measures were the radiological progression of the curve, surgery and quality of life. Results demonstrate that brace treatment is better than no-treatment (observation) or electrical stimulation. There is also no negative influence on the quality of life of patients with an idiopathic scoliosis. We can conclude that bracing is recommended as a treatment for female patients with a Cobb angle of 25-35°. The evidence level of some studies in the review was limited, so further research is necessary. In the literature there is evidence that exercises have beneficial effects on patients with idiopathic scoliosis. Physiotherapists may also address biopsychosocial factors. Adolescents who are presenting with idiopathic scoliosis and chronic low back pain symptoms may also have other factors such as insomnia, depression, anxiety and stress, and daytime sleepiness that need to be assessed and addressed as contributing factors to a chronic low back pain experience. An important one is the conservative three-dimensional Schroth method consisting of curve-specific exercises and corrective breathing techniques. The purpose of these exercises is to derotate, deflex and to correct the spine in the sagittal plane while elongating the spine. The elevation of both arms leads to an increase of the flatback deformity. Patient with right thoracic scoliosis (functional 3-curve pattern as seen on the left) performing the 'Door handle exercise' according to the new 'Power Schroth' principles (right). The corrected head alignment is not yet achieved but correction of the sagittal profile is already visible. Patient with right thoracic scoliosis (functional 3-curve pattern as seen on the left) performing the exercise 'Frog at the pond' according to the new 'Power Schroth' principles (right). The corrected head alignment is not yet achieved but correction of the sagittal profile is already visible. The patient needs to be focused about re-establishing spinal symmetry. The key to a successful therapy is to work consistently to correct the spine. Another difficult part of the therapy is to learn to shorten the muscles on the convex side of the spine and lengthen the muscles on the concave side of the side. This is because the muscles become imbalanced on opposite sides. The exercise position approaches the functional/structural threshold. 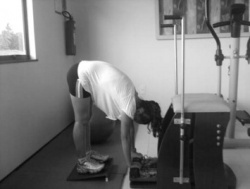 Schroth therapy takes advantage of the overcorrected positions. Basic corrections are reviewed by using mirrors in front and at the back of the patient. This posture requires concentration and coordination, applying the correct breathing, and well-adapted muscle length and tension. Respiratory education techniques (abdominal-diaphragmatic ventilation, thoracic mobilisation, ventilation at rest and during activities of daily living) for mobilisation and prevention of stiffness of chest and skeletal muscles. Postural drainage and vibration to evacuate mucus and decrease the resistance of the airways. Relaxation techniques to make sure that the patients would have better control of respiration (to counteract dyspnea). They found that the respiratory rehabilitation had a positive effect on increasing pulmonary function of children with scoliosis. Anwer et al. reported in a systematic review (2015) that evidence, of moderate-quality, suggest that an exercise program is superior to the control intervention. They reported a reduction in the following outcome measures: Cobb angle, angle of trunk rotation, thoracic kyphosis angle and lumber lordosis angle and improving the quality of life in patients with AIS. Evidence of lower quality, low-quality, suggested that an exercise program is superior to controls in reducing average lateral deviation in patients with AIS. The patient lies supine with the arms besides the body. The patient has to raise both legs till the toes touches the floor. Then, unroll spine slowly (vertebra by vertebra) Goal: stretching the posterior chain, mobilizing the spine and strengthen the abdomen. The patient sits in a four support position. Then raises the right arm and leg while the spine stays aligned. Than the same exercise but change arm and leg. Goal: Stretching the concavity of the vertebral spine. 2. Specific exercises: For these exercise Swiss balls, FlexBall Quarks are used. It’s important that the patients learn to breath right during exercise. Hip movements with a large ball (65 cm diameter). Goal: Strengthening the gluteal muscles and developing the equilibrium. Inverted abdominal skills with a ball (55 cm diameter). Goal: Strengthening the infraabdominal region and the ischiotibial muscles. Rising into a seated position. Goal: Strengthening the M. rectus abdominis. Lateral spine movement on a step chair with a spring of 0.1410 kg positioned in the rings to provide major resistance. Goal: Stretching the lateral muscle chain according to the direction of convexity of the scoliosis. Lateral spine movement. Goal: Stretching the lateral muscle chain according to the direction of convexity of the scoliosis. Flexibility on the step chair with a spring of 0,1410 kg positioned in the rings to provide major resistance. Goal: Mobilize the spine and stretch the paravertebral thorax and lumbar muscles. 3. Returning to a relaxed position (relaxation) :It consist of three movements, the patient has to repeat each exercise three times for five minutes. All exercises has to be performed rapidly. The purpose of these exercises are metabolic recovery and relaxation of the used muscles. The outcome needs to be age matched since the demands of daily life, professional performance, and leisure activities vary substantially in the diﬀerent age groups. Most of the patients who are still professionally active do not return to their previous work if it was a physically demanding job, but almost all of those had already stopped working before the surgery, because of pain limitations. When analyzed, regarding their overall daily activity by diﬀerent questionnaires, most of these patients irrespective of age have improved in almost all categories. Quality of life, and the use of regular pain medication is reduced substantially in more than 70% of these patients. However for the elderly the outcome is less positive because of the age. The major problem of these patients after surgery, once surgical complications and implant failures have not occurred, is the residual back pain mostly as an expression of muscular spasms and pain due to unbalanced or chronic contractures of the paravertebral muscles. Whether brace treatment for scoliosis is successful is often described using the curve progression of more than 5° before skeletal maturity as a benchmark for bracing failure rather than spine surgery. Some use 10° of curve progression or preventing the curve from reaching 45° at skeletal maturity. The outcome data should be determined from the percentage of patients with less than 5° or greater than 6° of progression at maturity, curves exceeding 45° at maturity, and progression resulting in the recommendation for surgery. Bracing studies should have a minimum of 2 years follow up beyond skeletal maturity. The first study to use these criteria determined a brace should prevent progression in 70% of patients to be considered effective. Regardless of the recommended standardized parameters, the goal of bracing idiopathic curves remains consistent: control the curve, prevent progression, and avoid surgical intervention. In conclusion it’s important to make a good diagnosis about the kind of scoliosis and the cause of the scoliosis. Management interventions should be weighed with the choices and complaints of the patient and the kind of scoliosis the patient is suffering from. It’s important to note that not all patients with scoliosis are actually suffering from this spine deformation. Every patient is different and deserves attention to deploy the appropriate treatment. ↑ Burnei G, Gavriliu S, Vlad C, Georgescu I, Ghita RA, Dughilă C, Japie EM, Onilă A. Congenital scoliosis: an up-to-date. Journal of medicine and life. 2015 Jul;8(3):388. ↑ 2.0 2.1 2.2 Johari J, Sharifudin MA, Ab Rahman A, Omar AS, Abdullah AT, Nor S, Lam WC, Yusof MI. Relationship between pulmonary function and degree of spinal deformity, location of apical vertebrae and age among adolescent idiopathic scoliosis patients. Singapore medical journal. 2016 Jan;57(1):33. ↑ 3.0 3.1 3.2 Anwer S, Alghadir A, Shaphe A, Anwar D. Effects of exercise on spinal deformities and quality of life in patients with adolescent idiopathic scoliosis. BioMed research international. 2015;2015. ↑ Hacquebord JH, Leopold SS. In brief: The Risser classification: a classic tool for the clinician treating adolescent idiopathic scoliosis. Clin Orthop Relat Res. 2012;470(8):2335–2338. ↑ Alison Middleditch et al., Functional Anatomy of the Spine 2005 2-6p. ↑ Konieczny MR, Senyurt H, Krauspe R. Epidemiology of adolescent idiopathic scoliosis. J Child Orthop. 2012;7(1):3–9. ↑ 7.0 7.1 7.2 7.3 Wong AY, Samartzis D, Cheung PW, Cheung JP. How Common Is Back Pain and What Biopsychosocial Factors Are Associated With Back Pain in Patients With Adolescent Idiopathic Scoliosis?. Clinical Orthopaedics and Related Research®. 2019 Apr 1;477(4):676-86. ↑ 8.0 8.1 8.2 Jonathan A. et al., A comprehensive review of thoracic deformity parameters in scoliosis, Eur Spine J (2014) 23:2594–2602. ↑ Ireneusz M. Kowalski et al., Early detection of idiopathic scoliosis – analysis of three screening models, Arch Med Sci 2015; 11, 5: 1058–1064. ↑ Balestroni G, Bertolotti G. EuroQol-5D (EQ-5D): an instrument for measuring quality of life. Monaldi Archives for Chest Disease. 2015 Dec 1;78(3). ↑ Pineda S, Bago J, Gilperez C, Climent JM. Validity of the Walter Reed Visual Assessment Scale to measure subjective perception of spine deformity in patients with idiopathic scoliosis. Scoliosis. 2006 Dec;1(1):18. ↑ Carreon LY, Sanders JO, Polly DW, Sucato DJ, Parent S, Roy-Beaudry M, Hopkins J, McClung A, Bratcher KR, Diamond BE, Spinal Deformity Study Group. Spinal appearance questionnaire: factor analysis, scoring, reliability, and validity testing. Spine. 2011 Aug 15;36(18):E1240-4. ↑ Bago J, Sanchez-Raya J, Perez-Grueso FJ, Climent JM. The Trunk Appearance Perception Scale (TAPS): a new tool to evaluate subjective impression of trunk deformity in patients with idiopathic scoliosis. Scoliosis. 2010 Dec;5(1):6. ↑ Juan Bago´ et al., Outcome instruments to assess scoliosis surgery, Eur Spine J (2013) 22 (Suppl 2):S195–S202. ↑ Patias P, Grivas TB, Kaspiris A, Aggouris C, Drakoutos E. A review of the trunk surface metrics used as Scoliosis and other deformities evaluation indices. Scoliosis. 2010 Dec;5(1):12. ↑ 16.0 16.1 Helenius IJ. Treatment strategies for early-onset scoliosis. EFORT open reviews. 2018 May;3(5):287-93. ↑ 17.0 17.1 17.2 17.3 Kaspiris A, Grivas TB, Weiss HR, Turnbull D. Surgical and conservative treatment of patients with congenital scoliosis: α search for long-term results. Scoliosis. 2011 Dec;6(1):12. ↑ 18.0 18.1 Fusco C, Zaina F, Atanasio S, Romano M, Negrini A, Negrini S. Physical exercises in the treatment of adolescent idiopathic scoliosis: an updated systematic review. Physiotherapy theory and practice. 2011 Jan 1;27(1):80-114. ↑ 19.0 19.1 19.2 Maruyama T, Grivas TB, Kaspiris A. Effectiveness and outcomes of brace treatment: a systematic review. Physiotherapy theory and practice. 2011 Jan 1;27(1):26-42. ↑ 20.0 20.1 20.2 20.3 20.4 Negrini S, Zaina F, Romano M, Negrini A, Parzini S. Specific exercises reduce brace prescription in adolescent idiopathic scoliosis: a prospective controlled cohort study with worst-case analysis. Journal of rehabilitation medicine. 2008 Jun 5;40(6):451-5. ↑ 21.0 21.1 21.2 21.3 Negrini S, Donzelli S, Aulisa AG, Czaprowski D, Schreiber S, de Mauroy JC, Diers H, Grivas TB, Knott P, Kotwicki T, Lebel A. 2016 SOSORT guidelines: orthopaedic and rehabilitation treatment of idiopathic scoliosis during growth. Scoliosis and spinal disorders. 2018 Dec;13(1):3. ↑ Schreiber S, Parent EC, Moez EK, Hedden DM, Hill DL, Moreau M, Lou E, Watkins EM, Southon SC. Schroth physiotherapeutic scoliosis-specific exercises added to the standard of care lead to better Cobb angle outcomes in adolescents with idiopathic scoliosis–an assessor and statistician blinded randomized controlled trial. PloS one. 2016 Dec 29;11(12):e0168746. ↑ 23.0 23.1 Negrini S, Negrini A, Romano M, Verzini N, Negrini A, Parzini S. A controlled prospective study on the efficacy of SEAS. 02 exercises in preventing progression and bracing in mild idiopathic scoliosis. Studies in health technology and informatics. 2006;123:523. ↑ 24.0 24.1 Negrini A, Parzini S, Negrini MG, Romano M, Atanasio S, Zaina F, Negrini S. Adult scoliosis can be reduced through specific SEAS exercises: a case report. Scoliosis. 2008 Dec;3(1):20.